Drones and satellites provide a great new opportunity for farmers to understand their crops. A new technology platform from local startup DroneClouds, shows how things are growing in the field using health and moisture maps. With international trade soaring and a variety of climate and soil conditions around the world, agriculture is becoming increasingly globalised and commercialised, driven by technological advances that optimise and economise input in an endeavour to yield the highest possible output by region. Worldwide, farming has very much become part of the Fourth Industrial Revolution, also known as Economy 4.0. Following on the Third – electronics, digitizing and the advent of information technology that has occurred since the middle of the previous century – the Fourth is the trend of tech-driven automation, data exchange and cognitive computing – the “internet of things” – that is dramatically altering the way we work, play, produce and consume. It is in this sphere that Cape Town-based DroneClouds is making its mark by assisting agri producers to monitor their crop growth throughout the season by using multispectral satellite and drone imagery. Health and moisture maps are delivered to farmers instantly on a web app and a mobile device such as a tablet and smartphone. Farmers can pin problem areas on their land and navigate straight to that specific point using their smart device. The DroneClouds map app allows for early identification of areas where stress occurs. It literally allows one to see how things are growing and how crops are developing and maturing over time and seasons. Embracing this new technology is a vastly more efficient way of farming than relying on only the traditional visible scouting of crops and a significant step closer into moving to precision and scientific farming practices. DroneClouds was founded in 2015 when it won a business model competition with Airbus Defence and Space and SANSA and is today run by electrical and computing engineer David Campey as CEO and product designer Steyn Viljoen, together with a team of developers, designers and farming experts. In the last two years, DroneClouds has garnered wide industry recognition for its innovations, winning the South African National Space Agency’s (SANSA) and the European Airbus Defence and Space’s (ADS) business model competition, taking second place in 500 Startup’s Geek on a Plane competition and being chosen as top 500 deep-tech startups to exhibit at Hello Tomorrow in Paris. Today it works with a number of prestigious institutions such as SANSA and Airbus, as well as IrriCheck, Kaap Agri and other players in the South African context. With partners like Irricheck, their expert water recommendations can be displayed on top of the moisture map to see how it corresponds with the rest of the field moisture. Kaap Agri allows farmers to buy DroneClouds satellite and drone services through their account, effectively putting this investment in technology on the same plane as other general farming overhead costs such as fertiliser and equipment. 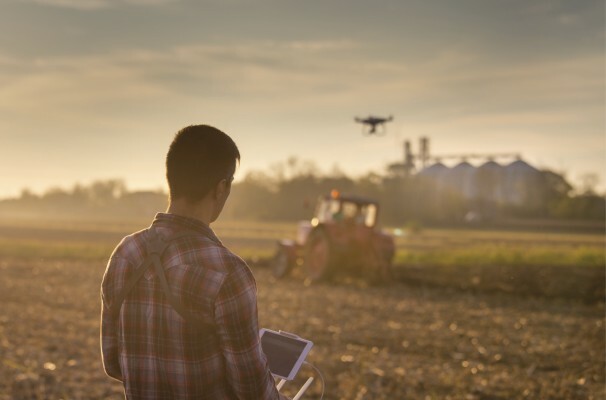 Last year, DroneClouds was chosen for acceleration by the European Agro Innovation Lab with BayWa and RWA, leading to collaborations within the group of companies. This included market entry with BHBW, BayWa’s local joint venture together with BarloWorld Holdings. One such early adopter embracing this new technology is Tulbagh farmer Adriaan Booyens, who has various cultivars of apple, pear, peach and prune under cultivation. Before taking up farming, he was an engineer and needed no convincing when it came to the benefits the moisture maps offered in planning his irrigation schedule. Any land under cultivation, anywhere in the world, can be analysed by satellite mapping to determine moisture and drainage, areas of compaction, uniformity of fertiliser distribution and effectiveness, and plant health through detection of various levels of plant stress. “To monitor their crop health on a continuous basis, producers have access to fresh satellite images every 5 days, to intervene the moment new crop issues become visible,” says Viljoen. The map app is easy to use and the basic package with 10-metre resolution satellite maps (100m2 per hectare) start at R9 500 per farm/year. Anyone, anywhere in the world can instantly see their first health and moisture maps free. From this starting point, there are offerings for higher-resolution maps using satellites and drones. Satellites can go down to 0.5m proximity. Drones are used for ultra-high resolution – from 2 to 10 centimetres per pixel. Using these for high-value crops such as citrus and nuts, every tree can be individually measured and tracked, allowing specific care to be given. 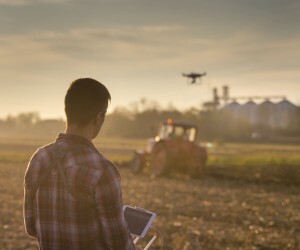 If you’re interested to learn more, there is a free trial on the website (droneclouds.com) for farmers. This offers health and moisture maps from the last year up until today, which will show you exactly what it looks like. DroneClouds can be contacted at www.droneclouds.com and twitter.com/droneclouds, as well as facebook.com/droneclouds.